In 1869, Joesph Sidney Seaman and some colleagues started a small foundry at the corner of Liberty and 25th Streets in Pittsburgh, PA. Mr. Seaman assisted George Westinghouse in the development of the air brake for use in locomotives. This air brake, which became known as the Westinghouse Air Brake (the company Wabtec, currently located in Wilmerding, PA, still is in the locomotive business), was first successfully cast in the foundry operated by Mr. Seaman. Some years later, Mr. Westinghouse purchased the foundry at Liberty and 25th. Subsequently, Mr. Seaman and Robert Sleeth formed The Seaman-Sleeth Co. and built a new foundry on 42nd Street between Willow Street and the Allegheny Valley Railroad. In addition, they added steel finishing capabilities that allowed the company to cast and machine large steel shapes, including steel rolls, for use in the booming mills for which Pittsburgh became known. 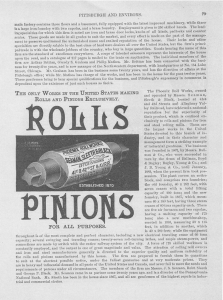 The Seaman-Sleeth Co. prospered and, in 1917, merged with Phoenix Roll Works to create Pittsburgh Rolls Corporation. After building additional manufacturing space extending to 40th Street, and having manufacturing on both sides of 41st Street, the City of Pittsburgh vacated 41st Street from Willow Street to the Allegheny River in 1933. Pittsburgh Rolls built an additional foundry where 41st Street had been. In the late 1930s, Pittsburgh Rolls Corporation was acquired by Blaw-Knox Corporation and the operation became known as Blaw-Knox Roll. Blaw-Knox Roll operated in Lawrenceville until the early 1980s, when a strong dollar and intense competition from overseas forced Blaw-Knox and other notable roll foundries to close. In 1984, Roy Neer moved his business known as Mill Equipment & Engineering Corporation (a.k.a. MECO) to the large industrial site that now encompassed approximately 4.5 acres from 40th to 43rd Streets between the Allegheny Valley Railroad and Willow Street. 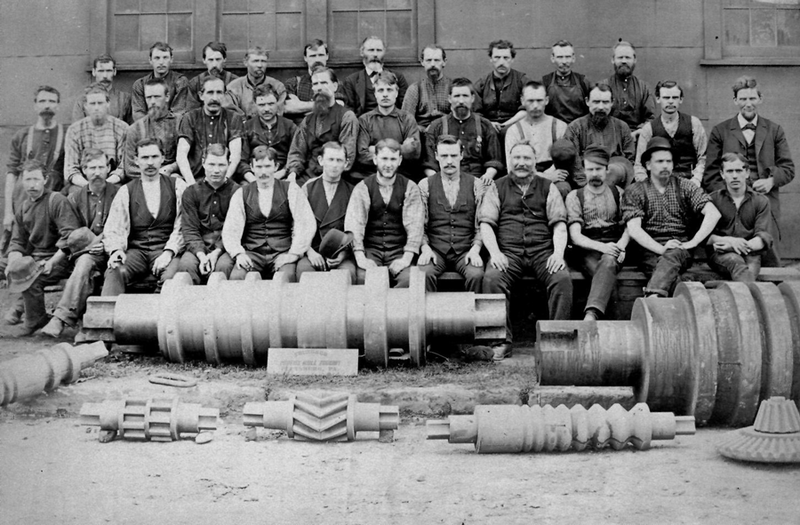 While the business did not include a foundry operation, MECO was engaged in large machining and finishing of, as its name suggests, mill equipment. Mr. Neer operated MECO until 1994 when it was sold to an investment bank. MECO and its successor entities, CCR Holdings and HSE Limited filed bankruptcy and began a liquidation in 1999. On March 15, 2000, Alexander J. Simakas formed Interlocking Deck Systems International, LLC (IDSI), and along with some others endeavored to enter into the business of manufacturing steel grid bridge decking. In October, 2000, IDSI signed a lease for the old MECO facility, which included a purchase option. As the steel grid market ebbed and flowed, IDSI began to expand into other industries under the name IDSI Fabrication & Machining. IDSI was the supplier of steel grid deck, soldier piles and other important bridge/highway, railroad, steel mill and energy-related projects across the United States and Canada, Costa Rica, Belize and other international locations. On March 27, 2010, Mr. Simakas sold IDSI’s grid deck operation to Pittsburgh’s L.B. Foster Company. IDSI fulfilled its remaining contracts and finally ceased operation in June 2011. Mr. Simakas formed Fort Willow Developers in 2013 and began master planning for the entire site. As Lawrenceville already had begun a transition away from heavy manufacturing, and recognizing a demand for residential living in Lawrenceville, Fort Willow Developers will begin construction on a 182-unit apartment building at the corner of Willow Street and old 41st Street. The project will be known as The Foundry at 41st. While The Foundry at 41st represents a major shift to residential, the first at the location since before Mr. Seaman moved to the site in the late 1800s, Fort Willow is retaining the steel frame of Bay 4, which was built atop 41st Street, in homage to the heavy industrial history of the site. IDSI’s old machine shop, Tool Craft, which was located in the brick structure along Willow Street between 40th and 41st Streets, also will be preserved for a future use. Fort Willow Developers hopes to create a unique multi-use development on this important Lawrenceville site.